In the depths of the winter of 1944, the Soviet Red Army executes a pincer operation against a salient in the German lines near the town of Cherkassy. Prevented from retreat by orders of Adolf Hitler, the German forces soon found themselves pocketed, their only supply source an airfield at the town called Korsun. The Soviets relentlessly tighten their stranglehold against the German troops in the pocket. At the same time, the Germans mount increasingly strong relief efforts against the outer Soviet perimeter. Can the German relief forces break the Soviet lines before the Soviet forces completely destroy the pocketed troops? Cherkassy Pocket was designed by John Desch, and features a system similar to his games Wave of Terror and Berlin 45. 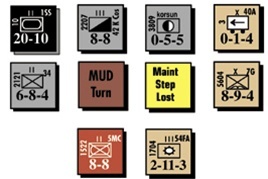 Units are battalions and brigades, and the ground scale is 1.25 miles per hex. Each game turn represents 24 hours, and each player gets to move and perform combat twice in a turn. When it's time to activate friendly units, a player may choose to move first and then fight or vice versa. 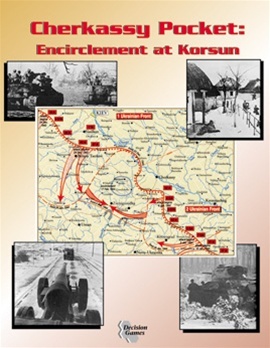 There are special rules to reflect the failure of Soviet tank maintenance, the use of the Korsun airfield as a supply source, Soviet difficulties in coordinating multi-formation attacks, and the ability for tank units to infiltrate enemy lines. Four scenarios allow you to play different portions of the battle, or to play the whole 23 turn campaign. Components: 22x34” mapsheet, 500 die-cut counters, a rulebook, player aid cards, storage bags, 1 inch box.